Got a neat e-mail and attachment from Martin Walter, who a few years back provided us with some stunning pictures, and who helped the entire Thomistic community by editing John of St. Thomas’s Cursus philosophicus. It turns out that he recently bought vol. 1 of the Leonine Edition (dating from 1882), which contained Thomas’s commentaries on Aristotle’s De intepretatione and on the Posterior Analytics—both of these editions were re-edited in 1989 as Leonine 1*/1 and 1*/2. The first tomus was published under the general editorship of Tommaso Zigliara, OP. toward whose publication Rev. Father Albertus Hoogland and Rev. 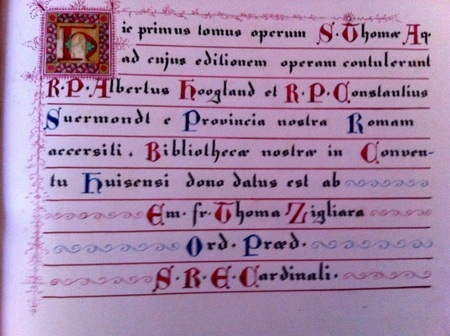 Father Constantius Suermondt contributed (summoned to Rome from our province), was given as a gift to our library in the convent in Huissen by <his> eminence, Brother Tommaso Zigliara of the Order of the Preachers, Cardinal of the Holy Roman Church. Both Frs Hoogland and Suermondt came from the Dominican Convent in Huissen, which seems to be the provenance of the book that Martin Walter bought. Which of course raises the question, “why did a Dominican convent part with a prized copy of a work by Thomas Aquinas?” That’s another investigation—Walter tells me that the book had multiple owners, at one point being owned by an Oratory. Thanks to Martin Walter for sharing this interesting discovery. Zigliara should not be forgotten. PS: Zigliara was not merely the general editor of the first edition of Thomas’s Commentary on the Posterior Analytics. He was also the author of careful annotations on Thomas’s text (i.e., made a commentary on Thomas’s commentary). Fr. James Weisheipl, in his own handbook on this key Aristotelian text (and Thomas’s commentary), singles out Zigliara’s fine treatment of how we are able to apprehend the essential forms of things through the senses (see Thomas, In II. Post., lect 13, no. 7 [Marietti edition]), and Zigliara’s notes (Leonine volume 1, p. 375 cols. a-b).